On successful completion of your Initial Suitability Inspection or Licence Renewal Assessment, the Licensing Inspector records the details on the Register of Licensed SPSVs and then applies two tamper-proof discs to your vehicle: one in the front window and one in the rear window. This marks the vehicle as a licensed SPSV. Limousines have a silver disc. 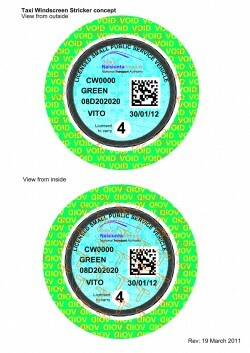 In addition to the tamper-proof discs, a licence certificate is also issued by post to the vehicle licence holder’s address. This is an important document so licence holder should ensure their contact details are correct at all times. This certificate contains important information regarding your licence and is required when transferring or surrendering a licence. The certificate provides information regarding the licence holder, the licence and the vehicle associated with the licence.It also provides additional information such as the licence’s transferability and any age rules and vehicle standards that apply the next time of licensing. 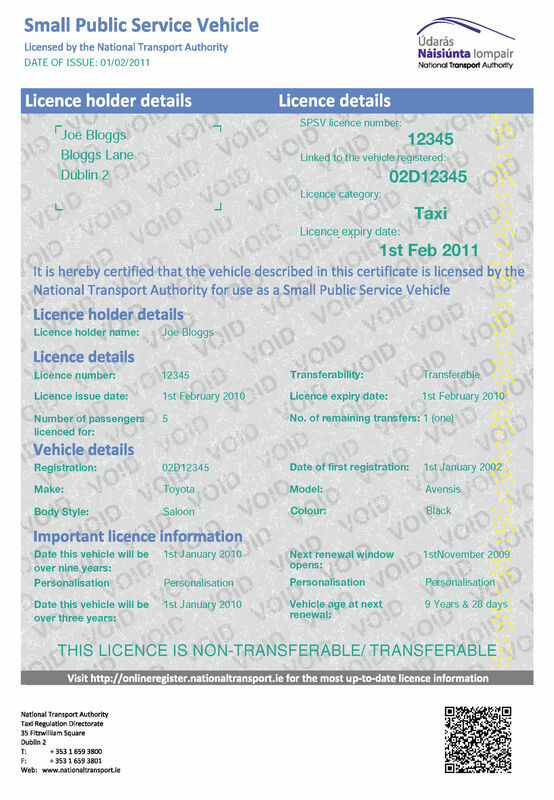 If you are considering applying for the transfer of a vehicle licence into your name, you should ask to see the vehicle licence which will inform you whether the licence is transferable.The Authority would also recommend you check the online register to ensure the licence is still transferable before proceeding. 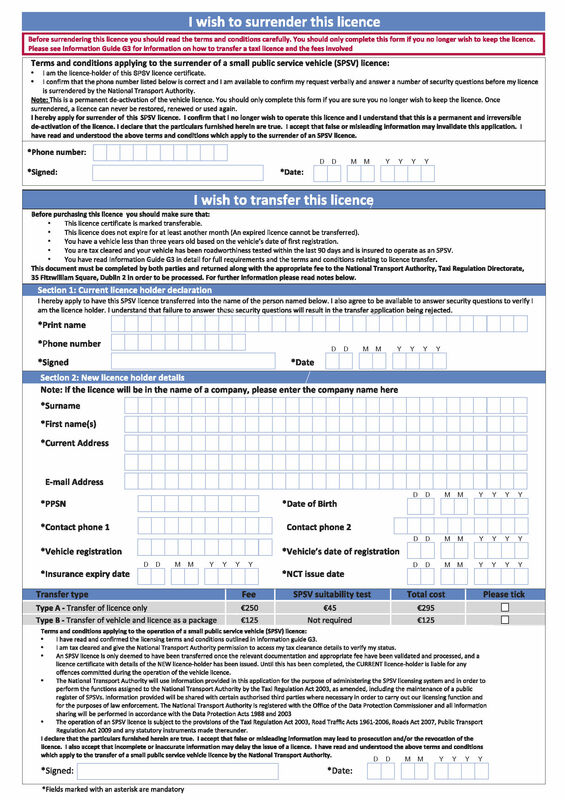 The reverse of the form acts as both a transfer and a surrender form, and must be used when completing either of these transactions.To surrender the licence you should complete the “I wish to surrender this licence”section of the form.To transfer the licence you must complete the “I wish to transfer this licence” section of the form.Section 1 must be completed by the current licence holder (seller) and Section 2 must be completed by the applicant (buyer).Once completed the original certificate and relevant payment must be submitted to the address below to be processed.